I have been meaning to do a rhinestone post for a while now, but it seems to work well in the context of my skating costume tutorial, so here we go. One of the most fun parts of skating costumes have to be the flashy brilliance and sparkle. Most costumes use rhinestones to achieve this, but sequins are an option as well. The lighting in skating rinks can be quite varied, and rhinestones seem to be the most versatile in terms of providing sparkle in different conditions. There are many different types and sizes of rhinestones, and I don’t mean for this post to be an exhaustive list, but rather an overview of what’s out there and what I recommend for skating. Also, I am just stating my recommendations and preferences. There are a lot of products, methods, and techniques out there but I am just going to point out what works best for me. Rhinestones are pieces of leaded glass cut to reflect light and look like little jewels. They come in a multitude of colors, shapes and sizes. The better quality stones have a higher lead content, and more consistent cutting of the stone. Most of this discussion will pertain to the small round flat-backed stones, and I will have a separate section dedicated to larger sew-on stones. Though there are cheaper options available, the only two brand of rhinestones I really recommend are Swarovski and Czech Preciosa. Swarovski is the brand name people recognize, and you are paying for the brand. I prefer the Czech stones myself – the cost is more reasonable, the colors are nearly identical, and unless you are a rhinestone expert comparing the stones up close, you really cannot tell the quality difference from the Swarovski stones. Swarovski does offer some colors that are not available in the Czech stones, and there are a few special effect colors that look very different between brands, but, in general, if you want to be friendly to your wallet I would go with a Czech Preciosa. If you are trying to sell something, Swarovski is the brand people respond to. If you just want to make a pretty and affordable costume, Czech Preciosa is the better buy. There are so many colors available that I cannot begin to describe them all. The main things you need to know is that there are regular colors (these are just plain glass rhinestones, but can be in clear crystal or any other color), AB colors (AB = aurora borealis; these stones have a special coating that gives them a rainbow effect), and special effect colors (these are often multiple colors of glass used in the same stone, but can also be stones with special coatings or backings to give them a different look than a regular rhinestone). The most commonly used color in skating is the crystal AB – it is a clear stone, so it picks up and reflects the most light, but the AB coating also allows it to blend in/pick up the color of the costume as well. It goes with everything and comes in the most sizes. There are so many different colors and types of stones that you really shouldn’t limit yourself though – be creative and choose stones that will be best for your costume. Most places online have color charts or pictures, but rhinestones are difficult to photograph, so if possible you should try to get your own color card, so you can be sure of exactly what you are ordering. Rhinestones are sold by the gross (1 gross = 144 pieces). Typically I will use 5-15 gross of stones on one dress. Granted, I am a fairly large individual (as far as the skating world goes), so if you are sewing for a younger child you probably won’t need as much. Also, I am a bit rhinestone obsessed, so there is that too. Often, when you order rhinestones you can get better rates if you buy in bulk (2 gross for larger sizes, 10 gross for smaller sizes), which is what I do since I know I will use them eventually. Rhinestones are most often sold by “stone size” or “ss” measurements. Smaller numbers mean smaller stones. For skating costumes I recommend staying in the 20ss or 30ss sizes, though anything in the 16ss-34ss range would be ok. I just think that 20ss and 30ss offer the best compromise of size, budget, and visibility from far away. Obviously, larger stones will offer more sparkle, but they are also much more expensive. Smaller stones don’t sparkle as well and they take much longer to attach to the dress. There are two types of flat-backed stones – glue on and hot fix. I prefer the glue on, as I am not convinced the hot fix adhesive will withstand repeated exposure to perspiration. Also, the hot fix requires a special tool (to melt the glue on the back of the stone), and having something that can burn me (or the dress!) is probably not the best idea when faced with a repetitive task that I often do late at night. So, I recommend the regular glue-on stones. The sew-on rhinestones are some of the most spectacular because of their large size and varied shapes. With these a little goes a long way, but a lot can be down right stunning. With the sew-on stones, Swarovski provides the best selection, and there almost no sew-on Czech stones to be found. I have recently been experimenting with cheaper quality Korean stones – these do not have the same clarity and color depth of the Swarovski stones, and close up you can tell that there is a serious difference in quality. Also, the coatings do not seem to be as robust and scratch much more easily. However, at a distance the cheaper stones do just as good of a job as the Swarovski stones at less than half the price. If you are going to use these larger stones on a figure dress or for non-skating clothes that will be seen up-close, go with the Swarovski. If you are making a costume for freestyle or dance skating, then the cheaper stones will suffice. The sew-on stones are often sold individually or by the dozen as opposed to by the gross. When you are using these larger stones I highly recommend that you sew them on and not glue them, as the glue will often be too weak to bear the weight of such large stones. Or you can glue and sew them for extra strength. Also, you want to make sure that the stones have flat backs and holes for sewing, as there are many large stones that have shaped backs or no holes. Unlike the small round rhinestones, the larger stone sizes are indicated by millimeters (mm). Sequins are the cheaper alternative to rhinestones. They are made of a foiled plastic, and come in an even wider variety of shapes, sizes, and colors than the rhinestones do. The most common varieties of sequins are cupped and flat. They are often sold by the 1000s due to their smaller size and cheaper cost. Usually they have a hole at the center, but some of them have multiple holes or holes located near the outer rim so that they can be threaded to dangle. Sequins often don’t have as much of a flash as the rhinestones do, but their cost makes them much more affordable for use in large quantities. They can be sold loose, strung, or on stretchy elastic trim. Usually the loose ones are best, but I have been know to buy strung ones because I wanted a particular colors, then un-string them so I could used them the way I wanted. Mixing sequins and rhinestones can be a great way to maximize sparkle on a limited budget. The Bead Factory (aka Bohemian Crystal) is a bead store located in the LA Fashion District. They offer many (many many) types of beads, but they also have a lot of crystals and rhinestones. They have become my source for Czech Preciosa stones, and they have a large selection of Swarovski stones as well (including sew-ons). They also have a few options for cheaper quality sew-on stones as well. They have a larger selection at their store than they do online, and their stock is constantly changing. They have most of the common stone sizes and colors, but not quite as much variety as I have found elsewhere. I have been to the store in person, and I have ordered from them online – both were good experiences in terms of quality and service. They aren’t overly helpful (they are VERY busy with many customers) but they will provide help if you need it or have a question. I find their service to be quite efficient and their prices are probably the best I have found. Dreamtime Creations is another online source of rhinestones. They offer many color and size options that can’t be found elsewhere. Their prices are reasonable and I have found their service to be very good. I use them to order special colors or special sew-on stones that I can’t get anywhere else. Nova Rhinestone is another store based in the LA fashion district. 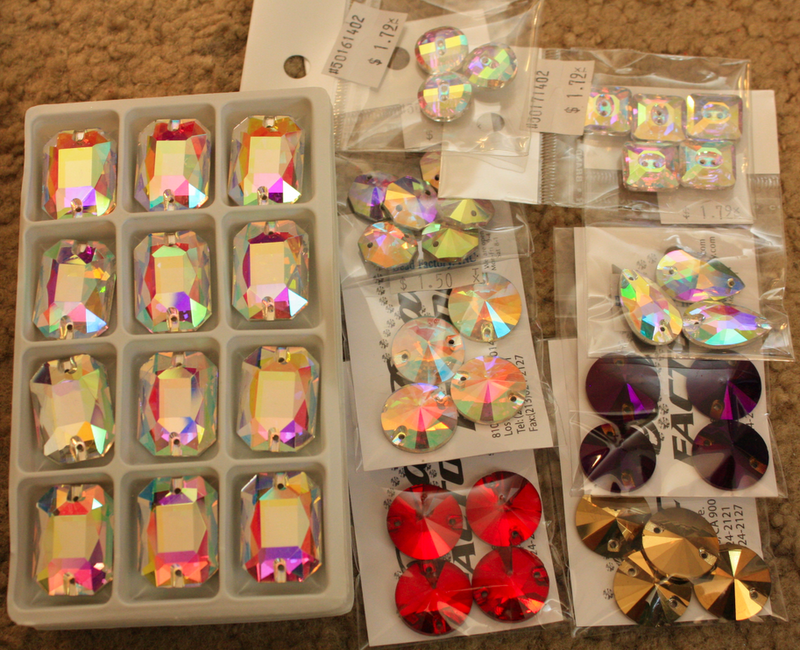 They have become my source for lesser quality sew-on rhinestones. I wouldn’t use their other products for skating costumes, but these larger stones look good at a distance, especially if you blend them in with better quality rhinestones on the rest of the dress. Cartwright’s is my favorite online sequin supply. They have the largest selection of sizes and styles I have found, their prices are great, and their service is speedy. I have always been pleased with the products I have ordered, and sometimes you can even find a good deal on large bags of “seconds” – most of the sequins are good, but there are enough bad ones (cut wrong) that they sell the whole thing at a discount. Applying the rhinestones to a skating costume is usually done in one of two ways – by gluing it on or by sewing it on. 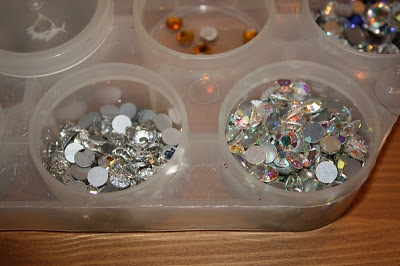 If you have the rhinestones without a hole, you will be glueing them on. I use E6000 as my glue of choice. There are a lot of people who dislike it (it is gummy, smelly, gunky, and stringy), but in my experience it has the best holding power. All other glues I have tried have not held up well to perspiration, or they not worked well on all fabric types. E6000 works equally well on velvet as it does on lycra. I think it provides the best hold and if you are careful in applying it, there aren’t too many issues with strings or messiness on the dress. My old method was to let it ooze onto a paper plate, and use a toothpick to scoop up some glue, then pick up a rhinestone with my toothpick and put it onto the dress. I generally use a twirling action to get a good sized glue drop and spread it on the back of the stone. This method takes a while but I think it provides the best control in terms of making sure you have enough glue on each stone and that the area around the stone doesn’t get too messy. However, if you are more interested in speed (as I am this year), then using a syringe is an alternative method. This can be a much quicker method of application, but you have to be careful about how much glue you squirt and you have to make sure to get the stone into the glue before it dries. Also, the syringe is usually not re-useable because once the E6000 dries it is totally stuck. The syringe method probably wastes less glue overall though. Sewing on a rhinestone or sequin depends on what type it is and how it needs to look. If you have a single-hole stone or sequin, usually it is held on with the use of a seed bead. You bring the needle up through the fabric, put the sequin and seed bead on the needle, then pull the need back through the sequin and fabric, creating a loop through the seed bead. In regular garments, most beading is done in a continuous string – you keep going until you run out of thread, and you can see lots of thread on the underside of the fabric. I do NOT recommend this for skating costumes. You must sew and tie off each stone individually because if you don’t then when the fabric stretches the threads will most likely pop and send all of your hard work falling to the floor. Which is sad for you and dangerous for the skaters. So you should sew on each stone individually. For those stones with multiple holes, you can just sew through them with thread. In general, I try to wrap the thread around the hole at least three times to provide strength and stability. The nice thing about sew-on stones is they are re-useable – you can cut them off of one dress and sew them onto another. However, I will say that sometimes the edges of the cheaper quality (non-Swarovski) stones are a bit rough and will cut through the threads, so I recommend glueing them AND sewing them, just to make sure they stay in place. Also, because I am paranoid about things falling off of my costumes, I also always glue the threads on the underside of the dress just to make sure they don’t come un-knotted. So – there you have it. 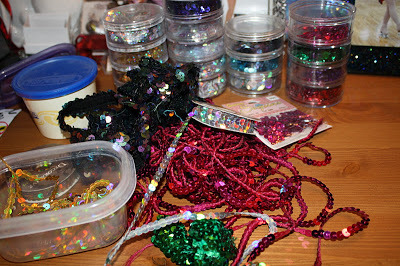 My accumulated knowledge of rhinestones and sequins. I hope that this will be helpful to those of you who are looking to add a little pizzaz to your costumes (or anything else, really). If you have any further questions feel free to leave them in the comments! Hi, love your blog! I was wondering how the sew on or glue on rhinestones hold up in the washing machine? I was thinking about adding some sew on ones to a tunic. Thanks! Wow! That's a lot of good information. Thanks for going into such detail. I hope your veil turns out well! Thanks for the compliment! I would say if you are going to be applying the rhinestones to something that will have repeated washings where you plan to use the washer and dryer, then the sew-on will hold better than the glue on. The glue-on will stay well through washings, but if you send then through a dryer multiple times it tends to make the glue lose its hold and the stones will fall off. 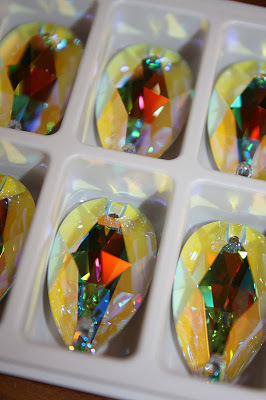 Also, the AB style stones might lose a bit of their coating after repeated washes, but I usually don't notice a problem with it if you get the Swarovski or Preciosa stones. If you get a cheaper quality stone then the coatings tend to come off much more easily. If you are using non-AB coated stones then it shouldn't be a problem. Thanks for such an interesting post! Filing for future reference. This is great information, thank you! Now I want to go embellish something… There must be a way to wear rhinestones to work, right? Do you think it's better to use A/B crystals for skating dresses? I starting stoning a dress (just dipping my toe in the water so I bought only 48 crystals). I bought rose colored crystals because it matched my dress better, but now I think I should have purchased the rose a/b stones even though it wasn't as close a match to the dress. Will the plain rose crystals shine as much as the rose a/b on the ice? I bought Swarovski crystals. Personally I think that the AB coated stones tend to have more flash at a distance, especially in non-optimal lighting conditions. I tend to use AB rather than the plain colors in most cases if I want the stones to be more obvious. I tend to use the non-AB stones for a more subtle sparkle. For shows with spotlights you tend to get equally good sparkle, but under normal rink lighting conditions I think the AB tend to show up better. You should still get decent amount of sparkle from the regular Rose color, but the Rose AB might give a bit more shine at a distance. Do you use a pattern to stone your garments? If so how to you what do you use to transfer the pattern onto lycra? I've always done stone placement/design freehand, though I have done applique work first, then stoned on top of that. If you want a more regular design then I recommend tracing the design onto a different fabric, attaching that to the garment, then placing the stones over the top of the design. Using different colors of fabric can give some really interesting designs that are visible at a distance. You can attach the design with iron-on fusible web (I've not tried this, but I'm going to start playing with this stuff soon), sewing it on (I recommend using a temporary spray adhesive to attach it first so it doesn't bunch in the machine), or glueing it on (E6000 now comes in a spray glue! I have to try this…). I'm a fan of sewing things down (you don't want to worry about costume pieces flying about while you are skating), but I've heard that others have used E6000 to glue small designs onto skating dresses without any problems. If you don't want to have to deal with a fabric applique, but still want a regular/repeating pattern then you could get a stencil and a disappearing/washable pen (from the fabric store, not like a Crayola) and draw the design right onto the dress. It will give you lines to follow with the stones, and the stone with cover the makings, which will either disappear with time or can be easily washed off after the glue dries. There are usually some cute stencils in the embroidery section of the craft stores. Finally, I suppose if there is a design you really want to follow, you could use carbon paper and a tracing wheel to transfer the design. I haven't used those tools much, and not on lycra at all, so I can't really say how well/if it will work, but it might be something to try. With any of these methods, I would do a test run on scraps before working with the actual dress. Thank you for the information on appliques the other day. 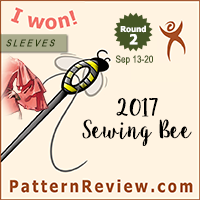 I am new to your site and it is now my go to as I have just started sewing dresses and am in process of making dance outfits which I have to stone. Your dresses are beautiful and it is nice to see all the info from someone what is in the “business” as there are differences between ice and roller and for newbies it is hard to figure out the difference. I just purchased precosia stones and am hoping the coach cant tell the difference (as she doesn't stone or sew herself). I have a question about crystal AB stones, do you find they give off more a pink reflection? I have some Swarovski but they look pink against the blue velvet and it is for my 10 year old son who will not want pink. The coach says she prefers these although I have not seen them on anyone else in the rink. Sorry for the slow reply – I was out of town for family. As far as Swarovski vs. Preciosa – most people can't tell the difference unless they handle them regularly (I can tell the difference on sight, up close, but not at a distance) or unless they see the package. I wouldn't worry about the coach in this case – once there are sparkles on an outfit they are usually happy. Also, I agree that the AB stones do tend to give off a pink reflection up close – far away you cannot tell. If you are dealing with a boy who will dig his feet in at the pink-ness (he has to wear it, so he can probably see the color up close) I would use Aqua Bohemica AB, Aquamarine AB, or Light Sapphire AB – they have a blue colored glass for the stone, but are very light and have the AB coating. It will be blue enough to hopefully prevent any complaints about the pink from the boy, but looks fairly similar to the Crystal AB, so hopefully it should satisfy coach as well. I would love to see some of your dresses. Can I view them on line ? I’m an adult skater just starting to compete . Do you have any dresses for sale. I’m an adult large . I’m going to bead a plain black dress for my free skate , music flash dance. I need a dress for Pocahontas colors of the wind. I do not have any for sale. So far I have only done custom work for people in my local area. 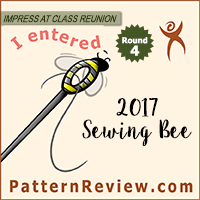 I do have images of my dresses online – if you go to the skating tab, there are links to the dresses I have made for myself as well as a list of links to the tutorial pages I have created for skating costumes. As someone who seems to know a lot about dance dresses, can you tell me what do you think about these ballroom dance dresses I’ve just found? Any suggestion would be appreciated, thanks! Thank you so much for posting your knowledge about this! I have a question about sequins. There are so many types that i’m starting to get confused on what type of sequin I should get for my skating dress. (If I can, I would love to send you a picture my dress design so that you can share your opinion on what sequin I should buy!). I’m creating a dress specifically for cosplay. However, I want it to be a full functional, legit skating dress if I were to skate in it on the ice. Therefore, the dress will need some washing from time to time but not a lot as it will MOSTLY be for show at conventions. 1.) What sequins shows up well on skating dresses without wearing away after washes (a sequin that is sparkly far away AND up close but NOT overwhelmingly sparkly up close where it looks like it’s “too much”)? 2.) I see sequins like Hologram and Metallic. Do you see a difference in these two when compared next to each other? 3.) I also see Flat and Cupped sequins. Is one better quality than the other? Does one create more sparkle than the other? Does one hold better onto LYCRA than the other? I apologize for asking so many questions, I’m just so lost in what to purchase! I don’t want to buy the wrong one. I wish I knew a place in Southern California that sells good quality sequins in person! Thank you in advance and I look forward to your response! 1) I find that the flat sequins tend to have more “flash” and are better at a distance and cupped sequins have more “twinkle” and won’t look “too much” up close. Though, to be fair, it’s a skating costume, so the line of “too much” is pretty far out there. 2) Hologram tends to have the rainbow effect in the foil, often in different patterns (lines, dots, etc.) whereas metallic tends to be a color over a plain silver foil (no rainbow). It just depends what effect you are going for. Also, if you are going for a vintage skating costume look (like, pre-2000’s) you will want to go with metallic. 3) I’ve used both, they are both fine. If you really want to make sure things are going to hold, even with a lot of washings, I’d sew them on, but it’ll take a lot more time. If you are mostly wearing this at a con and just going to wash it once in a while, glue should be fine for either type (I use E6000 glue). Sequins would fall off my costumes, but that was after over a year of skate-sweat-wash-dry-repeat on a weekly basis, so it shouldn’t be too much of a problem for what you want. 4) Sadly, Berger’s Beads in LA garment district closed down. They had a LOT of sequins you could look at in person. 5) As for recommendations, I don’t think you can really “go wrong” with sequin embellishments. I think the most critical feature is the size (6mm-10mm is fairly standard) and the color. As opposed to crystal rhinestones, where there is most decidedly a quality difference, sequins tend to be fairly standard.